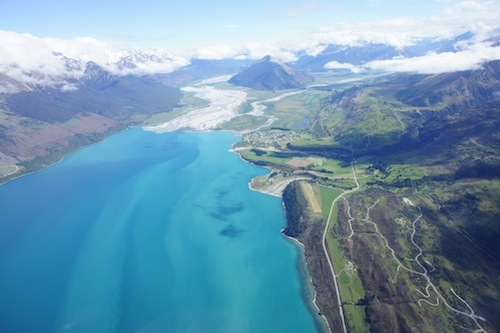 Queenstown, New Zealand is considered the “adventure capital of the world” which means you get to hurl your body off a variety of locations, such as bridges (bungy jump), trees (zip on a harness on thin lines between tree tops at the Ziptrek Eco Tours), hillsides (paragliding) and airplanes (skydiving). For those more inclined to keep their feet close to the ground, there are long, arduous hikes that take days (e.g., the Milford Track and the Routeburn Track) or hours (hiking up the Ben Lomond trail high above Queenstown). And there are mountain bike trails everywhere for all levels. 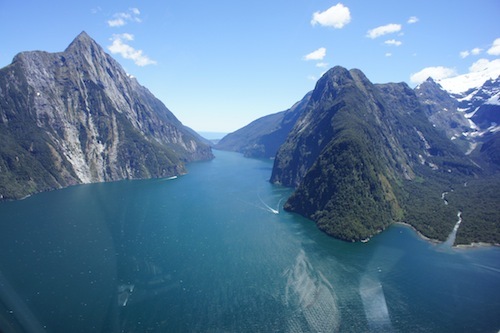 But the absolute must-do in Queenstown (weather permitting) is to take a helicopter tour of the area all the way to Milford Sound. It’s an unforgettable experience. 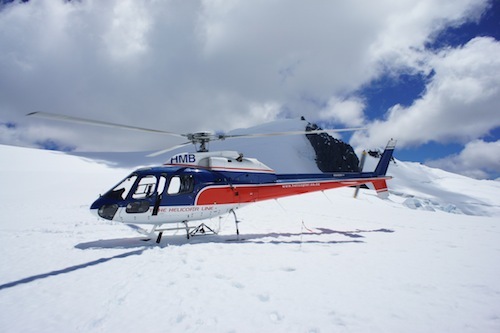 The helicopter takes only up to 4 people. It takes you to Milford Sound, drops you off so you can do a 2-hour boat tour of the Milford Sound itself, then on the way back to Queenstown, it even stops on top of a glacier so you can walk around and take photos (see below). All that activity is bound to make you very hungry indeed and the Queenstown region is home to excellent wineries that specialize in pinot noir, as well as restaurants that serve wonderful lamb, beef and seafood (especially the green-lipped mussels) dishes. If you are staying in Queenstown for a week or more, treat yourself to yoga sessions and spa/massage treatments as well. In my opinion, the Queenstown Park Hotel is the best place to stay in town. It is only about five minutes’ walk from the center which means you can walk to town easily to eat out or go bar hopping, but you won’t suffer from the noise of partygoers leaving bars and restaurants. It is a luxury boutique hotel with only 19 suites so it feels intimate, and the staff are able to provide excellent, personal service. I stayed at this hotel in early December. Read my detailed review of the Queenstown Park Hotel. If you cannot get a room at the Queenstown Park Hotel, consider staying at Eichardt’s Private Hotel (housed in a historic building right on the lake), The Dairy Private Luxury Hotel, or the Azur Luxury Lodge (very expensive). I am not a huge fan of chain hotels, but if desperate, there is a Sofitel and a Novotel in town. Nearly every guidebook recommends a burger joint in the center of town called Ferg Burger, which serves gigantic burgers (lamb, beef, venison) and judging from the long queues and the Japanese tourists taking photos of their plus-sized meals, you’d think the burgers must be amazingly good. They aren’t. It’s not that they’re bad. There’s just nothing special about them. Worse, after eating one of the burgers, I had a bit of a tummy ache and for the rest of the day, I felt as if a giant concrete block were sitting in my belly. There are other better options for food in Queenstown and here are my suggestions. Botswana Butchery: an elegant restaurant on the water that serves delicious meat dishes. Located at Archers Cottage, 17 Marine Parade, Queenstown, +64 3 442 6994. Expensive; romantic atmosphere. Kappa: Japanese noodles, bento boxes and sushi in an upstairs cafe that has a personal touch. I visited the other Japanese restaurants in town, but they all feel impersonal and cold. I prefer Kappa. Inexpensive. Address: 36 The Mall, Queenstown. Fishbone: funky seafood restaurant with innovative fish and shellfish dishes; go for the green-lipped mussels. Address: 7 Beach Street, Queenstown. Moderately expensive. Wai: elegant seafood restaurant on Steamer Wharf right on the water with lovely views of the lake and surrounding hills. Expensive but worth it. Reservations necessary. Vudu Cafe: cozy cafe (2 locations in Queenstown) serving sinfully delicious cakes, pastries and sandwiches. Excellent place to grab breakfast. Downside: no Wi-Fi. Address: 16 Rees Street, Queenstown. It’s worth driving 15 minutes to get to Arrowtown, a small village outside Queenstown. It is known for cute boutiques, cafes and restaurants. The best restaurant in Arrowtown is Saffron, considered one of the best restaurants in New Zealand. beurre bos pears poached in pinot noir & palm sugar with pandan & buttermilk bavarios, molk foam wafers. The proprietors of Saffron have recently published a beautiful coffee table book with gorgeous photographs and recipes. Located at 18 Buckingham Street,which is the one and only main street in Arrowtown. We did not have reservations for lunch; we just walked in. But if you want to have dinner, reservations are a must. Phone: +64 3 442 0131. Yoga Nadi has a lovely yoga studio in the center of Queenstown so you can do your poses while enjoying the sweeping views of the lake. I recommend taking a class with Greg Dorn who is a terrific yoga teacher and an acupuncture specialist. I went to one of Greg’s yoga classes and it completely restored my mind and my body. Address: Yoga Nadi, Level 2, 50 Stanley Street, Queenstown. See the Yoga Nadi schedule. There are many spa and massage places in Queenstown, and they often have special offers so check the Queenstown guides. I went to the Aspects Day Spa for a deep tissue massage and felt rejuvenated after that. Apart from the ubiquitous sporting goods stores selling hiking and camping paraphernalia and activewear, there are a number of quirky little shops and cute boutiques in Queenstown. My favorite is Vesta Design Store which sells jewelry, prints, ceramics, books, homeware (gorgeous throws and pillows), knitted hats and scarves, handmade soaps, organic creams and lotions. It boasts of an in-store cafe where you can get excellent espresso. I want to buy everything in this store and the ambiance is just so special. Yoga in Queenstown, I read the topic and find interesting.